As already stated several times on this thread, without numerical data, it is not realistically possible to improve the calibration of the tractive effort. What is the data source for that? Me and someone else from the forum had a little discussion regarding this and also moving to liveries, will the class 800 be able to be liveried into LNER (London North Eastern Railway (VTEC (Virgin Trains East Coast when designed))? I am not sure that I quite understand the question; it is possible in principle to produce graphics for the liveries of anything. I think that the .blend files for this are now available, so you should be able to modify the 3d models used to create the graphics for this rather than producing entirely new 3d models. If someone makes the livery graphics and updates the .dat files, then certainly. The graphics are already there (well the old VTEC graphics anyway). But do the acceleration rate have to be given in tractive effort? The tractive effort and power (principally the tractive effort) are the only parameters in the physics engine that control the rate of acceleration. If the graphics that you are interested in are already present, I do not understand your earlier question. The power has already been stated correctly, as this was set from data. I am aware that there is no available information for the tractive effort, as discussed quite some time ago on this thread, I believe. I still do not understand the question about the livery: you are of course quite free to produce a new LNER (modern) livery for the class 800, and I believe that the .blend files exist and are available so that you can modify the existing 3d models to produce the new livery variants. You mean the livery scheme? You can certainly add one of those: just add one to the end of the livery schemes section in the pakset specific simuconf.tab. You will see the correct format by looking at the others. As for the acceleration being "very good", as I believe has been discussed on this thread now quite a number of times, such vague information is unusable. I need numerical data for calibration. Please do not keep asking me to adjust the tractive effort based on unusable vague information. If you have numerical data on actual acceleration rates on the flat with a specific configuration/formation, you can run your own tests in-game to deduce the correct tractive effort by testing to see whether it accelerates to the given speed within the correct number of tiles at 125m/tile based on the source data, and, if it does not, adjust the tractive effort multiplier in the advanced settings dialogue (press the "i" key to access) until it is correct. This multiplier can then be reset in the advanced settings dialogue but multiplied by the tractive effort figures given in the class 800's .dat files. If you do this, you will need to give me full information on the numerical source so that I can verify its accuracy, and also upload the saved game that you used for testing. Maybe we should leave the tractive effort thing for now because I have looked for it and no website gives the figures for tractive effort unfortunately. 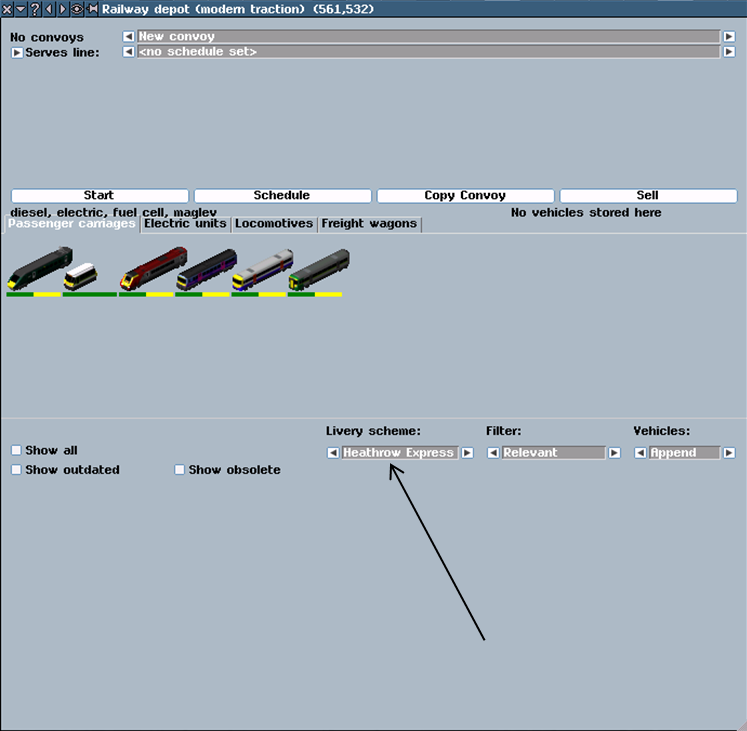 Also how to do mod the simuconf.tab? It is a text file, so you can edit it in the same way as any other text file. Okay, I'm in it now. So exactly, what do I do to get the VTEC livery from the class 801 to be applied onto the class 800? This is not the question that you were asking before: previously, you were just asking about adding a livery scheme for the new LNER livery, which is not at all the same thing as applying the livery of one sort of vehicle to the livery of another sort of vehicle. I cannot remember now whether the class 801's vehicles all look identical to the class 800's vehicles. If they do, you can just use the graphics for those class 801 vehicles in a new livery of the class 800. If not, then you will need to create new graphics. However, are there class 800s (as opposed to class 801s) in the VTEC livery? Splendid, thank you for confirming. Do let me know when you have modified the .dat files so that I can update the pakset with them. Where can I find these .dat files? Where are these sources, because I cant just guess what sources there in because their are alot of sources of Simutrans stuff. Please be more specific next time! All the details are on this stickied thread, to which you have responded in the past. I've worded it wrong again, havent I? Sorry for the run around but I mean the .dat file sources. You will need to compile this yourself to check for errors: you should at least check yourself that your code works before uploading it. Coming back to this (after some while), will it be possible to make the class 800/801 have the same livery variants. If you would care to modify the files accordingly and test them, I should be happy to include such a change. The only thing is now is that the IET fleet will not carry Virgin livery and now carry the LNER livery and also that I am no good at doing such stuff. If you can find somebody who has the time to do this and is willing and able to do so, I should be happy to incorporate this into the pakset. About the acceleration rate thing, did you say that you wanted the acceleration rate in horsepower, because I found the horsepower for the class 800s on wiki. and the horsepower is 750 (560 kW) per engine (for I assume diesel).